or you may join us for one of our week-long summer day camps. determine the pace at which they will advance to the next level. themselves and our animal friends. Private & Small group lessons - Offered in eight week sessions consisting of a 1/2 hour session each week. Small groups consist of two riders. Riders should plan extra time both before & after each lesson to help groom & tack up their horse if able to do so. 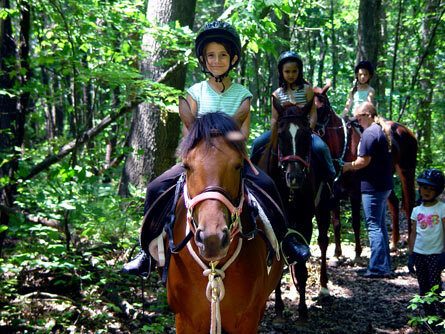 Heatherwood facilities offer indoor & outdoor riding arenas for year round instruction. We also take students on our riding trails. We welcome adult & child riders of all levels, from beginners to those ready to advance to jumping. Whether you want to learn to ride for pleasure, advance to horse shows, or ride for an excellent way to exercise, Heatherwood Academy will tailor a program for your interests. different breeds of horses & will groom a horse. Parties are scheduled year round. to work on and earn merit badges. outdoors (weather permitting) or visit Heatherwood for an educational field trip. Horse Drawn Carriage rides - For special occasions such as proms, weddings, anniversaries, business events, etc. Horse Drawn Sleigh rides - Winter fun for the whole family.